After the death of Steve Jobs, his widow, Laurene Powell Jobs is one of the most influential and powerful women in the world. Naturally, eyes follow her every move. Including when she takes a vacation with her boyfriend. Laurene Powell Jobs took a break from the work that comes with being one of the most powerful women in the world and went on a vacation. She and her daughter, Eve, are in Croatia making the most out of the $100.0 million yacht Steve Jobs reportedly never got to use. And joining the mother and daughter is Laurene Powell’s boyfriend, Adrian Fenty. That renews the interest in the man who is dating Steve Jobs’ widow. If you haven’t heard about Laurene Powell Jobs’ boyfriend, check out our Adrian Fenty wiki. 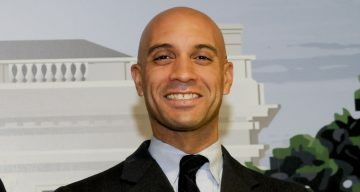 The middle child of three kids born to Jeanette Bianchi Perno Fenty and Phil Fenty, Adrian Fenty is Italian-American. His mother’s family is originally from the Lazio region of Ital,y while his father is from Buffalo, New York with roots in Barbados and Panama. Fenty was born and raised in Washington D.C. with his parents running a Fleet Fleet athletic shoe store. He graduated from Oberlin College with a bachelors in English and economics and acquired a J.D. from the Howard University of Law. Before he actively participated in politics, he was in the background of D.C.’s political scene. He was an intern for senators and members of the House of Representatives. Fenty made his foray into politics by getting elected to the D.C. Council in 2000. Five years later, he ran for D.C.’s Mayor. Becoming the state’s youngest mayor ever, he held office from 2007 to 2011 which was highly contentious because of his stand on the education system. His radical changes didn’t get him reelected for a second term. Even if it cost him a second mayoral term, Fenty’s strong opinions and drive to change made his advise very valuable to businesses. He served as a consultant with several companies, including venture capital firm, Andreessen Horowitz. Fenty was also an adviser for Philadelphia accounting firm, Heffler, Radetich & Saitta. He was also named a distinguished professor of politics and a feature lecturer at the Department of African American Studies at his alma mater, Oberlin. His resumé contains more consulting jobs at different firms. Despite being a public figure, his net worth hasn’t been calculated. Still, we’re pretty sure it’s far from his billionaire girlfriend’s. Adrian Fenty was married to Michelle Cross and together, they were known as D.C.’s most stylish couple. They met at Howard Law School where Michelle was his mentor. The daughter of Jamaican immigrants, she was raised in London and is an attorney. Together, they have twin boys Matthew and Andrew, and a daughter, Aerin. Though only 17, Andrew is well on his way to becoming an internationally ranked tennis player. Cross kept a low profile during her husband’s political run. She rarely made an appearance except for certain events like hosting Michelle Obama and Jill Biden. In 2013, it was revealed that the couple had separated and were getting a divorce. At that time, Cross moved to Trinidad and Tobago to work with the Inter-American Development Bank. Apple co-founder, Steve Jobs passed away in 2011 of complications from pancreatic cancer. He left behind billions, four children, and a grieving widow. A very noteworthy philanthropist, Laurene Powell Jobs doubled her charitable efforts since the death of her husband. It was during one such event in Houston where she met a mayor who shared her passion for improving the lives of under-served students. Powell and Fenty became quick friends which developed into something more. The former mayor and his wife separated for a year before they initiated divorce proceedings. The same time they filed for divorce, news of Fenty and Powell dating surfaced. Though Fenty was technically married when they started dating, he and his wife were separated long before that. Fenty joined College Track, a non-profit co-founded by Powell, as board member. He even left his longtime home in D.C. to work with Andreessen Horowitz in Silicon Valley where Powell is based.